Some would say that it’s part of Aston Martin’s old-world charm, choosing to do things in the old way. The presenter is playing what looks like pat-a-cake with one of my colleagues, slapping his hands back and forth, palm-to-palm, then palm-to-back-of-hand. “This is how an automatic transmission works,” he says with a delightful British accent, high-fiving the journalist in front of me. “And, this is how a dual-clutch automatic works.” High-five with both hands. “But our 2015 Aston Martin V12 Vantage S does it like this,” and he sandwiches one of the journalist’s hands with both of his own. I’m already headed for the door. Instead, every surface feels both refined and sturdy, like it’ll hold up to the test of time. Aside from the new “S” designation, the most noticeable change in the 2015 V12-powered Vantage S is the variety of new colors. With the brand’s bespoke “Q” series, you can have the car just about any way you’d like it, but even the standard choices feel a little more wild and Italian than subdued and British. Looking for electric blues or shimmering yellows? Aston has you covered. And, if you want to get wild with the carbon fiber, you can have colored vents and air dams installed, too. My particular car was China Grey with wine-red carbon fiber and black satin 19-inch wheels. 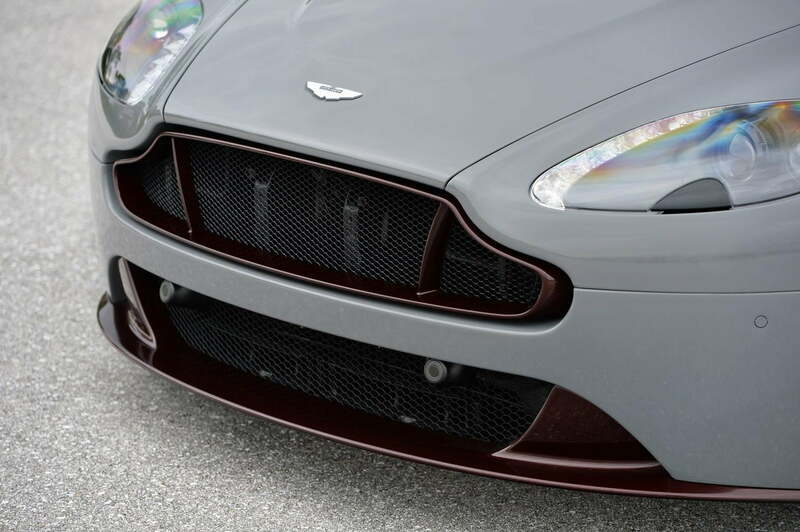 I would later find that the colored carbon came from the Aston Martin Q series, also making my particular car the most expensive one on the track, weighing in just shy of $220,000. No matter how you choose it, the Vantage still looks gentlemanly, but the color palette can take you from black tie chic to Le Mans race day in a hurry. Inside, every surface is covered in leather, Alcantara, or carbon fiber, and the fit and finish is exquisite. I’ve been in cars before that feel expensive, yet fragile, but the Vantage is not one of those cars. Instead, every surface feels both refined and sturdy, like it’ll hold up to the test of time. There are two different seats available: the power sport seats, or the lighter-weight, more aggressively bolstered chairs meant for track use. I didn’t get the chance to sample the fixed seats, but I also never felt like I was slipping around without them. Plus, I think I’d choose the more comfortable seat anyway. The steering wheel is thick, and the paddle shifters are within easy reach of the fingertips. Since we try to look at these cars in terms of daily drivability and the technology that aids in that mission, I think it’s important that we call out a few of our perceived shortcomings here. The V12 Vantage S is a sports car more than a grand tourer, and the majority of today’s modern driving technology just doesn’t make the list. Yes, there’s navigation and a reverse camera, but that’s about it. If you’re looking for radar cruise control, blind spot detection, or any of the crash avoidance systems, you’ll have to step out of the super-premium brands and into something a little more mainstream, a la the Mercedes-Benz SLS or Audi R8. Instead, Aston Martin leaves the driving to the driver, focusing all of its attention at the machine underneath the metal. The V12 Vantage S replaces the previous Vantage V12, and with it comes a new engine, too. Dubbed the “AM28”, this updated 6.0-liter V12 produces 565 horsepower and 457 lb-ft of torque; it’s the same V12 shared in the larger Vanquish and Rapide models. It’s a formula that’s sure to work: place your most powerful engine in your smallest car. In place of the old Vantage’s three-pedal setup, the new S comes with a “Sportshift III” seven-speed automated manual, which weighs 55 pounds less than traditional manual, according to the Brits. 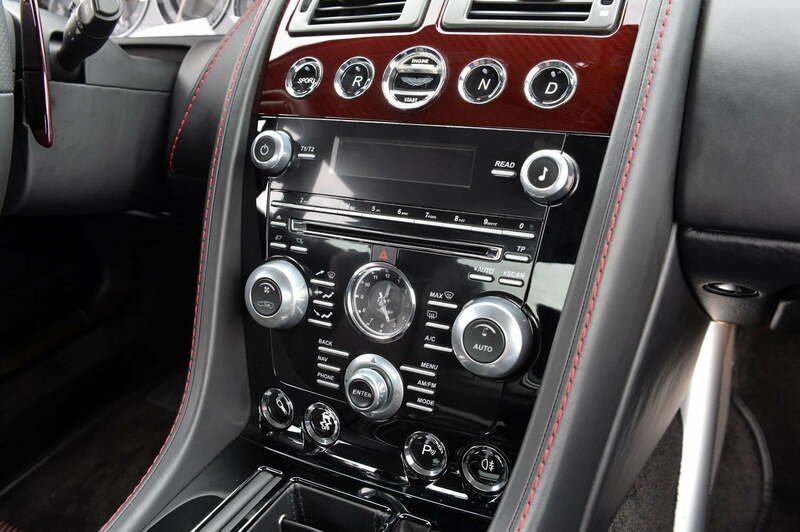 Depending how you’d like to drive the car, you can select settings on the console for normal or sport throttle response and shifts, and normal, sport, or track settings for the suspension, too. This baby Aston did, in fact, feel totally at home on the track. 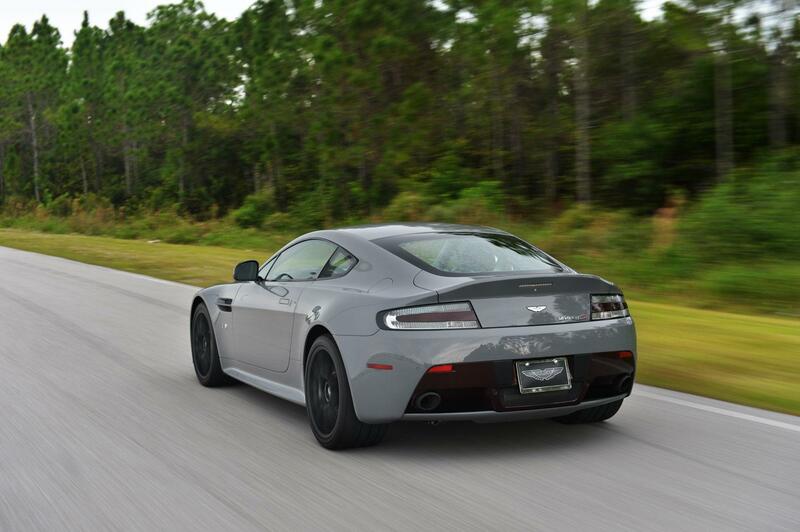 My day with the 2015 V12 Vantage S wouldn’t include any time of the streets of Palm Beach, but we would have the entire morning on the track, and the afternoon to run the drag strip. The folks from Aston paired us with professional drivers, who would talk us through the corners of the track and where to dig into the accelerator. My first reaction was that I had a babysitter named Simon, but, as it turned out, Simon helped me improve my lap times by several seconds each loop. There’s an argument in itself to be made that Aston Martin owners should probably pay for a few lessons with these guys just to learn how to manage their cars, but that’s a different story, a different trip. Per Simon’s instruction, I started the track day with every mode set to ‘normal’. The suspension was soft, the throttle was smooth, and I made a gentle, comfortable lap of the track. The next lap was faster, and the lap after that was my first aggressive run. It was in that third lap when I found that performance driving in the car’s softest settings absolutely does not work – the transmission bucks between shifts, and I actually hit my helmet against the A-pillar once. After that lap, I pulled into the pit lane to grab a bottle of water. I had already made up my mind about the Vantage: I didn’t like this car, with all fault falling to the transmission. Simon’s eyes widened and he insisted that there’s a “time and a place” when one should change the settings, and that would change my mind. So, we jumped back in again. He was right, mostly. 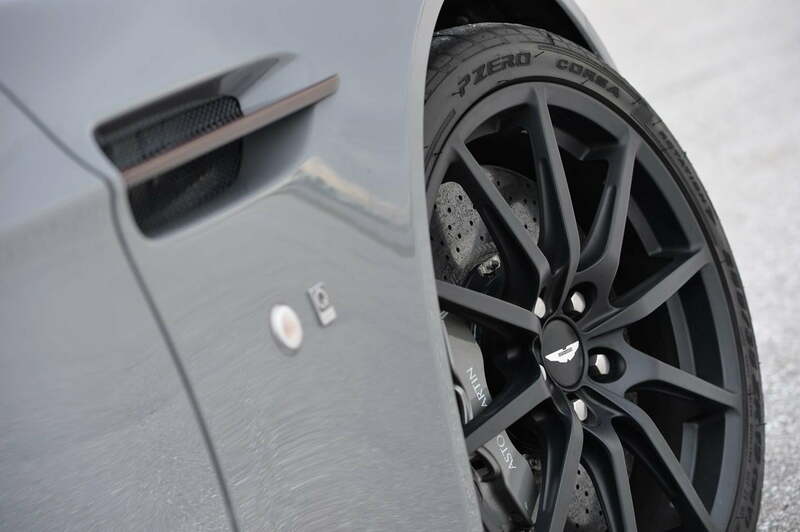 Switching the car into the sport and track settings allowed the Vantage to shift significantly quicker between gears, and the handling became razor-sharp around turns. Steering became ultra direct, and it was suddenly obvious that this baby Aston did, in fact, feel totally at home on the track. From those loops, we moved to the drag strip, where I had my first chance to really bomb down the road with all of the available 565 horses. Again, we sampled each of the settings, and again, I realized that sport mode was meant for sporty driving, and normal mode was intended for day-to-day use. We ran from 0-60 in just under four seconds – the car is rated at 3.7 – and we hit 144 mph before I had to hit the brakes. It was at that time when I realized that the Vantage V12 had a Dr. Jekyll and Mr. Hyde quality about it. The practice of observing the car, arriving in it, and claiming ownership of Britain’s premier sports car brand was a thing meant for the caviar crowd. Tuned soft, it’s gentle and manageable, and parking an Aston out front just seems fancier than parking a comparably priced German car. However, if you switch a few of the sport buttons and push the Vantage hard, it’s also nearly as rewarding to drive as its Teutonic rivals – and it’s every bit as nasty. The hard part here is understanding why there isn’t a middle ground between James Bond and James Hunt, when so many of the others out there offer a better-rounded experience. 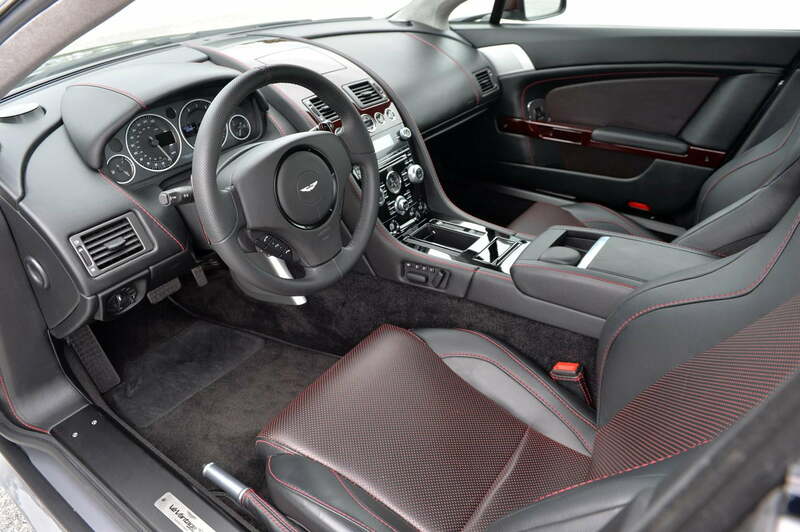 However, some would say that it’s part of Aston Martin’s old-world charm, choosing to do things in the old way. And those same folks might just say that owners of the 2015 V12 Vantage S know there’s a time and a place to drive like a gentleman, and a time and a place to race.